Helps maintain a constant vehicle speed and a set following interval behind a vehicle detected ahead of yours and, if the detected vehicle comes to a stop, can decelerate and stop your vehicle, without you having to keep your foot on the brake or the accelerator. When ACC with LSF slows your vehicle by applying the brakes, your vehicle's brake lights will illuminate. WARNING Improper use of ACC with LSF can lead to a crash. 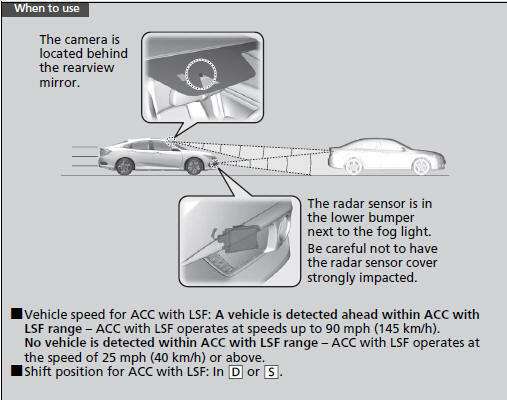 Use ACC with LSF only when driving on expressways or freeways and in good weather conditions. WARNING ACC with LSF has limited braking capability and may not stop your vehicle in time to avoid a collision with a vehicle that quickly stops in front of you. Always be prepared to apply the brake pedal if the conditions require. As with any system, there are limits to ACC with LSF. Use the brake pedal whenever necessary, and always keep a safe interval between your vehicle and other vehicles. 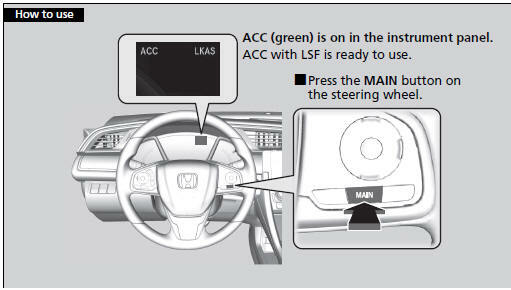 When the MAIN button is pressed, both ACC with LSF and the Lane Keeping Assist System (LKAS) are either turned on or off. ACC with LSF may not work properly under certain conditions. When not using ACC with LSF: Turn off adaptive cruise by pressing the MAIN button. This also will turn off the Lane Keeping Assist System (LKAS). On roads with heavy traffic or while driving in continuous stop and go traffic. On roads with sharp turns. On roads with steep downhill sections, as the set vehicle speed can be exceeded by coasting. In such cases, ACC with LSF will not apply the brakes to maintain the set speed. On roads with toll collection facilities or other objects between lanes of traffic, or in parking areas, or facilities with drive through access.